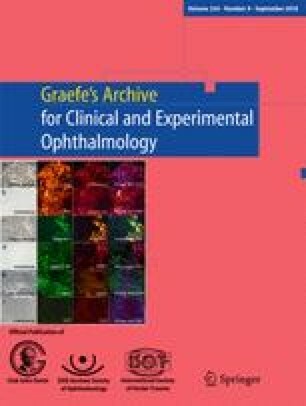 To describe and analyze the biomicroscopic features and in vivo confocal microscopy of the crystalline form of pre-Descemet corneal dystrophy (PDCD). We examined two non-related families using biomicroscopy, in vivo confocal microscopy, and a genetic study using a gene panel test, looking for mutations in the PIKFYVE gene. A slit-lamp examination of the first family revealed polychromatic crystalline punctiform opacities distributed all over the stroma in 8 of 11 family members in three generations with an autosomal dominant inheritance. The second family showed in three of four members in two generations the same opacities located in the pre-Descemet region. It was also a hint for autosomal dominant inheritance. The in vivo confocal microscopy identified numerous rounded and hyperreflective stromal particles measuring 10–15 μm in diameter, with the highest density in the posterior stroma and with normal keratocytes. No systemic disease was diagnosed. No variants or mutations were identified in PIKFYVE gene. Polychromatic deposits in patients with Punctiform and Polychromatic Pre-Descemet corneal dystrophy can be located not only in the deep stroma but also in the anterior and middle stroma. Our presentation reveals the possibility of considering this characteristic corneal disorder as a corneal dystrophy of its own and not as a subtype of pre-Descemet corneal dystrophy. The online version of this article ( https://doi.org/10.1007/s00417-018-3993-x) contains supplementary material, which is available to authorized users. A correction to this article is available online at https://doi.org/10.1007/s00417-019-04276-4. All procedures performed were in accordance with the ethical standards of the institutional research committee (La Paz University Hospital Ethics Committee) and with the 1964 Helsinki declaration and its later amendments or comparable ethical standards. Informed consent was obtained from all individual participants included in the study.